Real home cooked food, soups, snack menu, light meals & main meals with different daily specials on the blackboard, delicious desserts and cakes. 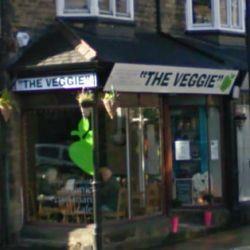 The Veggie is a new organic vegetarian café which opened in Ilkley in Spring 2008. The business is totally independent and owned and run by Kim Green. The aims of The Veggie are to offer simple and tasty organic vegetarian food in a welcoming, homely environment with the emphasis on friendly personal service. Customers may eat in, outside by the window (in summer!) or take away. Speciality: Delicious and nutritious, real home cooked vegetarian food. Warm friendly service, always happy to cater for any specific dietary requirements, always have vegan options on the menu. Heading west on the A65 Leeds Road towards Ilkley, pass Booths supermarket and we're 2 minutes further, on the left, ride by the side of the road.